Like many southern cities, Macon, Georgia has two Baptist churches with the word “First” in their names. The First Baptist Church of Christ, located on High Place, is predominantly white. The First Baptist Church a block away on New Street is predominantly African American. The churches share a common origin. In the 1840s, the black members of what was then the only “First” Baptist in town formed their own congregation separate from the white church. On Pentecost Sunday, however, the two churches came together to worship. It wasn’t the first time they have worshipped together, but pastors James Goolsby Jr. (New Street) and Scott Dickison (High Place) are committed to deepening the relationship between the two congregations. Furthermore, they intend this relationship to benefit the community, particularly in the area of mentoring and tutoring in Macon’s public schools. Christians of different ethnic origins worshiping together and sharing the bread and the cup of the Lord’s Supper shouldn’t be front-page news. Finding a way to our common heritage as disciples of Jesus Christ has never been easy, though, as today’s lesson demonstrates. In the church at Antioch, there were both Gentile and Jewish believers in Jesus. They each brought their own customs, preferences, and ways of doing things to church with them, and apparently it took a while for the church to work out exactly how to accommodate those differences. So it was that Paul felt compelled to confront Peter himself on the issue of Jewish-Gentile table fellowship. We can’t claim that Gentiles are our brothers and sisters in Christ, Paul seems to say, and then refuse to eat with them. That’s not what the body of Christ is all about. 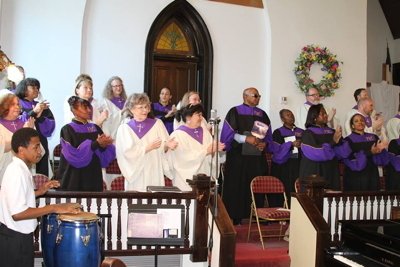 Phillip Ramati, “Historic Black and White Macon Churches Coming Together for New Partnership,” The Telegraph, 22 May 2015 http://www.macon.com/2015/05/22/3760086/historic-macon-churches-coming.html. • Have you ever participated in a worship service where two (or more) distinct “flavors” of Christianity came together? What was it like? • Why might some people be hesitant about attending such a gathering? • If circumcision and table fellowship were Paul’s issues, what are ours? What beliefs or behaviors do we require of others that are rooted more in our culture than in the gospel? • How should believers respond when others add additional requirements to the gospel? [The] conflict between Jewish and gentile views of circumcision is strongly reflected in the NT. The word is often used to distinguish between the two: the Jews are “the circumcised,” the gentiles “the uncircumcised” (Rom 3:30; 4:9; 15:8; Gal 2:7-9; Eph 2:11; Titus 1:10). Indeed, there were those in early Jewish Christianity who insisted that there could be no membership in the new community of faith without the covenant mark of circumcision. Luke describes them as “those of the circumcision” (Acts 11:2). They represented the traditional Jewish understanding that all proselytes to Judaism must be circumcised as a sign of membership in the covenant people. Since Christianity was a Jewish messianic sect, it followed logically for them that a gentile must first become a Jew in order to be a Christian, and conversion to Judaism entailed circumcision and observance of the Mosaic Law (Acts 15:2, 5). Paul did not see it that way. Whatever precedents or convictions about the messianic age may have led Paul in his decision not to circumcise gentile converts, the step was a key to the success of that mission. Given the gentile attitudes toward the rite, circumcision would have likely presented an insuperable barrier to the spread of the gospel outside Judaism. As it was, the Jerusalem leadership endorsed Paul’s circumcision-free mission to the gentiles and maintained a separate witness to the Jews (Gal 2:1-10). The Jewish Christians continued to circumcise their infants and in general to abide by the Jewish law. There resulted in effect two types of Christians, the circumcised and the uncircumcised. Paul continued to be troubled by the stricter Jewish Christian “Judaizers,” who insisted that gentiles live by the whole law, including its ceremonial aspects. It is interesting to note that in Galatians, where the Judaizing threat was acute, Paul particularly centered on circumcision as the most offensive part of their agenda (5:12,6:12-13). In his gentile mission, Paul ceased to believe the actual rite had any meaning: “neither circumcision nor uncircumcision means anything, but faith working through love…but a new creation” (Gal 5:6; 6:15). John B. Polhill, “Circumcision,” Mercer Dictionary of the Bible, ed. Watson E. Mills et al. (Macon GA: Mercer University Press, 1990), 156–57. Interpreters of Gal 2:11-14 often have been puzzled that two of the church’s key leaders, both prominent in the foundational stories of the Christian faith, should have differed as sharply as Paul and Peter did at Antioch over the issue of table fellowship. In the early centuries of the church’s life, theologians struggled to account for the embarrassing fact that one apostle (in most circles taken to be the chief apostle) was reprimanded publicly by another apostle and then the incident was recorded in a letter widely circulated among the churches…. For a period of ten years, Jerome and Augustine engaged in a rather heated correspondence over the nature of the conflict at Antioch. Jerome, following an earlier interpretation by Origen, argued that Peter’s decision to withdraw from eating with the Gentile Christians could be explained by the fact that he was being true to his calling to be a missionary to the Jews (Gal 2:7), just as Paul was faithful to his calling as a missionary to the Gentiles. Peter withdrew in order to prevent confusion from arising in the minds of Jewish Christians about their continued obligation to the law. After all, Paul had initiated the circumcision of Timothy (Acts 16:1-3), which proved he was really no different from Peter. On the other hand, Augustine differed sharply with Jerome’s exoneration of Peter, arguing that it made Paul in his rebuke of Peter in Gal 2:14 to be a liar. Peter’s behavior was reprehensible, Augustine contended. And yet in a concluding letter to Jerome, he also lifted Peter up as a symbol of “sacred humility,” one who accepted his rebuke without complaint and “gave a more precious and holy example to posterity than Paul did” (Letters 28, 40, 75, 82). Clearly in the early church, immense energy was invested in the effort to mitigate the opposition between the two prominent apostles and especially to picture Peter in a more positive light than the embarrassing portrait Paul provides in Gal 2:11-14…. Modern historians have been interested in the incident in Antioch for different reasons than the theologians in the early church. They see it as a pivotal event in the early church’s struggle to define itself in relation to its Jewish heritage. While the Jerusalem meeting (2:1-10) indicates agreement between the leaders of the Jewish and Gentile wings of the church, the Antioch incident indicates disagreement. Paul’s version is the only canonical account of the confrontation, and thus the details of the confrontation are critical. Charles B. Cousar, Reading Galatians, Philippians, and 1 Thessalonians (Macon GA: Smyth & Helwys, 2001), 41–43.